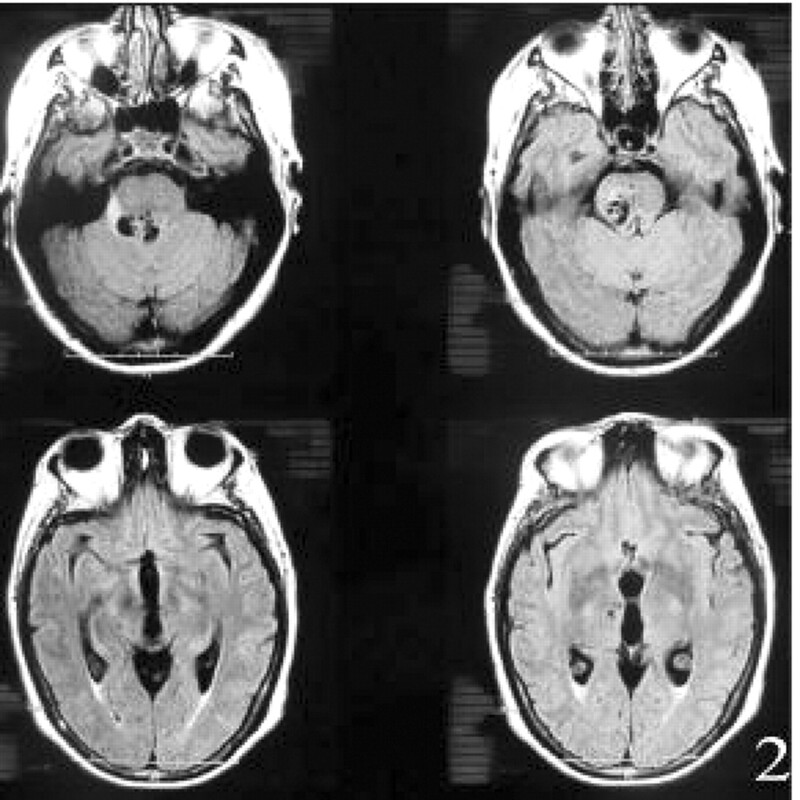 Summary: We describe a patient who showed cystic lesions in the midbrain and obstructive hydrocephalus. MR imaging features corresponded to abnormal dilatation of perivascular spaces. 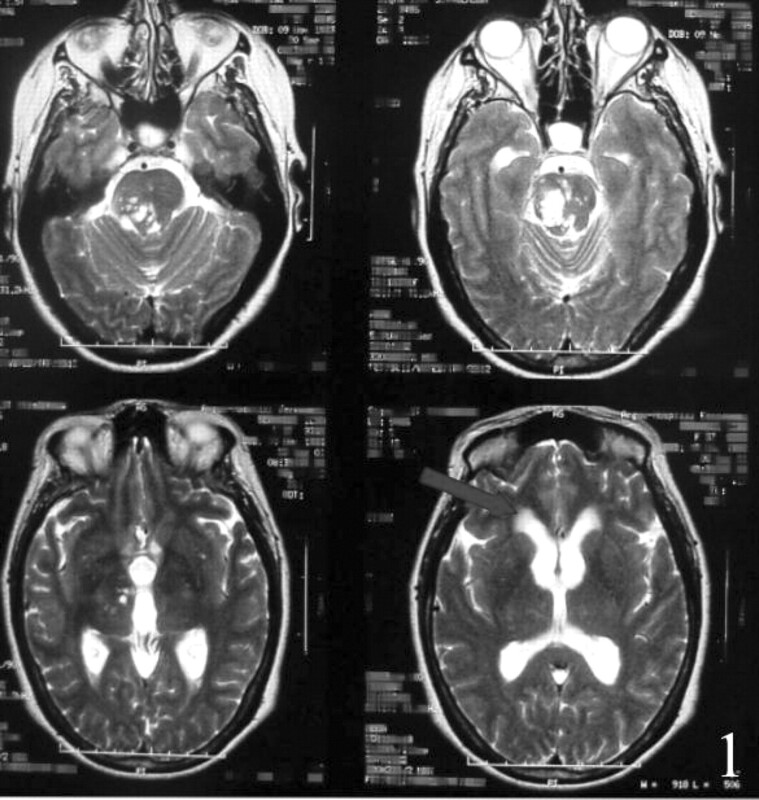 Similar clinical and MR imaging findings were described in previous reports of patients presenting with mesencephalo-thalamic expanding lacunae; the diagnosis of some of those cases was confirmed at postmortem examination This condition is extremely rare but should be part of a differential diagnosis when evaluating cystic abnormalities in this area of the brain. Expanding lacunae, or abnormal dilatation of perivascular spaces, are not commonly seen. We describe a patient with cystic structures in the midbrain and hydrocephalus caused by the compression of the cerebral aqueduct. MR imaging features were similar to those observed in patients in whom the histologic examination could be carried out (1–3). A 57-year-old woman with cardiac insufficiency and atrial fibrillation was admitted to our hospital in July 2001 after a 6-month period of depression, emotional lability, bradykinesia, gait disturbances, and tremor of the jaw. She had previously presented with visual hallucinations, which had resolved after treatment with low-dose haloperidol. On admission, the patient was alert with a mini–mental state examination score of 18/30 (she failed in orientation, attention, memory, and comprehensiveness). She showed nystagmus in 30° gaze and restriction of upward eye movements and convergence. At rest, a 5-Hz tremor of the jaw, right arm, and right leg was also seen. Rigidity of the four limbs, with a right predominance, was observed. The deep tendon reflexes were increased, but neither Babinski nor Hoffman signs were present. The muscle strength was normal. A distal 3-Hz kinetic tremor appeared when she extended her upper limbs. There was bradykinesia, and her gait was short-stepped and unstable. Routine blood laboratory findings were normal. Serology findings for HIV and purified protein derivative were negative. Chest CT showed nonspecific pleural calcifications, and an abdominal CT scan was normal. Brain MR imaging showed multiple cystic lesions, some of them confluent, involving the right part of the midbrain, extending from the thalamus to the pons (Fig 1). Their size ranged from 2 to 13 mm, and they were surrounded by normal parenchyma and showed a similar signal intensity to that of CSF on all images (Figs 2 and 3), including on diffusion-weight MR images. No enhancement appeared after the intravenous administration of contrast material. Most of these lesions predominated in the mesencephalon, pushing and obliterating the sylvian aqueduct, creating a noncommunicating hydrocephalus and transependymal migration of CSF. CSF was obtained by a transventricular puncture and an enzyme-linked immunosorbant assay for cysticercosis was negative. Cryptococcus neoformans, Histoplasma capsulatum, and Coccidiodes immitis antigens in blood and CFS were negative, as were cultures of CSF for fungal organisms and tuberculosis. Axial T2-weighted images (5400/103 [TR/TE]). Multiple, confluent, hyperintense, cystlike lesions exist in the right thalamo-ponto-mesencephalic region, exerting mass effect and compressing the cerebral aqueduct and the upper half of the fourth ventricle. 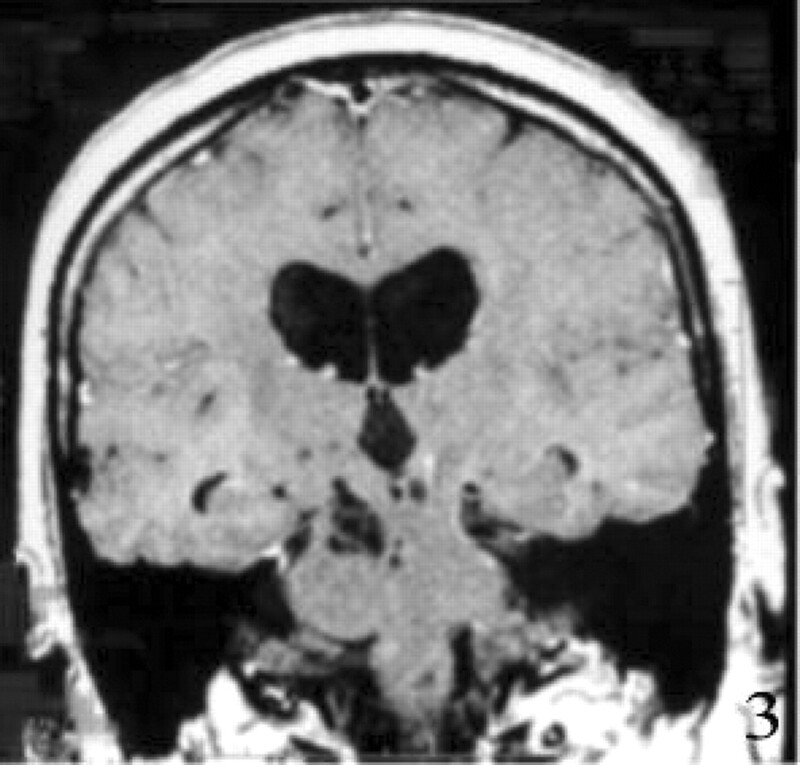 The arrow shows periventricular edema caused by the obstructive hydrocephalus. Axial fluid-attenuated inversion recovery images (9002/126/2250[TR/TE/TI]). A subtle hyperintense signal partially surrounds the lesions, compatible with a gliotic reaction. Coronal T1-weighted MR image (480/14 [TR/TE]). The lesions are isointense with CSF, a finding consistent with noncommunicting hydrocephalus. L-dopa was administered at progressively increasing doses, starting at 125 mg and ending at 500 mg, with an apparent clinical improvement of rigidity, bradykinesia, and tremor; however, this effect was brief and later ceased. MR spectroscopy was performed by using a single 20 × 20 × 20-mm voxel in the mesencephalon showing the following ratios: N-acetylaspartate (NAA)/creatine (Cr) = 2; choline (Cho)/Cr = 1.67; lactate could not be found (Fig 4). A (20 × 20 × 20 mm) proton MR spectrum (2000/144 [TR/TE]) obtained at the level of the mesencephalic cystic formation. A slight increment of Cho with no lactate is shown. This pattern is different from that observed in parasitic or tumor cysts. The increment in Cho could be due to demyelination surrounding the lesions, explained by the mass effect exerted by the spaces adjacent to parenchyma. In June 2002, the patient underwent surgery, and a ventriculoperitoneal shunt with a medium-pressure Holter valve was inserted via a right frontal approach. There was a prompt improvement of her gait difficulties, urinary incontinence, and bradykinesia, and she remained in stable condition for the following 6 months. Postoperative MR imaging showed a marked reduction in ventricular size, with no change in the cystic lesions (Fig 5). No changes were observed on the last MR image, performed 6 months after surgery and 18 months after the first MR imaging examination. Postoperative axial T2-weighted images (5400/103 [TR/TE]). Resolution of hydrocephalus is shown, with no change of the midbrain lesions. Perivascular enlargements, or Virchow-Robin spaces, are seen on MR images as small foci that are isointense to the CSF with all pulse sequences and conform to the path of penetrating arteries as they enter the brain from the subarachnoid space (4–6). Small Virchow-Robin spaces (<2 mm) appear in all age groups. In a retrospective study of MR imaging, age, arterial hypertension, dementia, and the incidental white matter, lesions were found to be significantly associated with large Virchow-Robin spaces (5). Typically, they lack mass effect and are asymptomatic, but in our patient and in those other cases with expanding lacunae reported earlier (1–3, 7–9), the perivascular spaces expanded more than usual, acting as space-occupying lesions. After analyzing the clinical data and laboratory findings, it was possible to assume that the cystic structures located at the mesencephalon were responsible for the patient’s symptoms and caused the hydrocephalus by compressing the aqueduct. Regarding the origin of the cysts, infections and putative tumors were excluded by appropriate laboratory examinations and different MR findings. Diffusion-weighted imaging was performed to distinguish the lesions from epidermoid cysts, because epidermoids have a marked restriction of diffusion relative to CSF, thus allowing differentiation from enlarged CSF space (10). MR spectroscopy was performed to better characterize the cystic lesions. It is well known that MR spectroscopy adds information in these type of lesions (11, 12). In parasitic cysts and abscesses, various combinations of lactate, acetate, succinate, and amino acids have been identified in the absence of normal brain metabolites. This pattern is different from that observed in cystic tumors, in which a reduction in NAA and increase in Cho are seen in addition to a variable amount of lactate and lipids. The results of MR spectroscopy in our case revealed no major abnormalities and matched those found by Mascalchi et al (8) in their report of two patients with this condition, the only difference being that Mascalchi et al were able to demonstrate increased lactate levels in their patients. We observed a slight increment in Cho, which was probably due to demyelinated areas surrounding the lesions included in the analyzed voxel. Demyelination could be explained by the mass effect exerted by the spaces on the adjacent parenchyma. Poirier et al (1) reported the first case of expanding lacunae in a 54-year-old woman with dementia in whom the lesions had the same localization as our patient and as a few other reported cases (5–9). Poirier’s case was confirmed by anatomic investigation showing segmental necrotizing angeitis on paramedian mesencephalo-thalamic perforating arteries. Poirier and Derouesné (13), in 1984, defined this type of lacunae as “type III d” in their pathologic classification of cerebral lacunae. The etiopathogenesis of this process is not yet known, although some hypotheses have been proposed. Poirier et al (1) thought that it could be due to changes in vascular permeability caused by vasculitis, but no evidence favoring this mechanism were found in other cases that underwent pathologic examination. Other authors observed vascular changes in pathologic specimens of patients with enlarged Virchow-Robin spaces that may be attributed to systemic hypertension (14, 15); however, there was no evidence of arterial hypertension or brain vascular lesions attributable to blood hypertension in our patient and in those of Mascalchi et al (8) and Homeyer et al (7). In every case reported in the literature, the mesencephalo-thalamic expanding lacunae were associated with hydrocephalus (1–3; 7–9). Derouesné et al (15) proposed that the cysts, or lacunae, might arise from difficult drainage of interstitial fluid into the ventricular system due to increased intraventricular pressure, and this possibility might be acceptable if there were primary hypertension within the ventricular system. We believe, however, the hydrocephalus was the consequence of the compression of the aqueduct by the lacunae rather than its cause. A clue for discarding primary hypertension of the ventricular system as the cause of the lacunae are the findings of Mascalchi et al (8), who observed that the treatment of hydrocephalus did not prevent the enlargement of the lesions. On the other hand, Homeyer et al (7) considered that an initial disorder of the lymphatic drainage might be responsible for the enlargement of the perivascular spaces, which would lead to an impaired interstitial fluid drainage. This type of interstitial drainage was best studied in animals, where it could be demonstrated that it consists of channels that travel along the cranial and the spinal nerves. Homeyer et al’s hypothesis seems to be the most reliable, although it needs further confirmation. Virchow-Robin spaces were initially observed on MR images in the basal ganglia (along the pass of the lenticulostriate arteries through the anterior perforated substance) and in the cortical gray matter (along the pass of the perforating medullary arteries) (5, 6). Later, several investigators noted they could be also found in the brain stem, predominantly in the pons. Anatomic specimens revealed that the enlarged perivascular spaces in the midbrain were located around penetrating branches of the collicular and accessory collicular arteries (4). It is not explained why in some cases the enlargement of the spaces is seen predominately in one of these regions, supra or infratentorially. In addition, in many cases, including ours, the disorder is asymmetric as the lesions predominate at one side of the brain. This condition can be localized, whatever its cause. The prognosis of these patients is uncertain. Wilkins’s patient was followed for 4 years, during which time no changes in MR imaging characteristics were noted (8), whereas the number and size of cysts increased in Mascalchi et al’s patient during 4 years of follow-up (6). Surgical treatment for the hydrocephalus has produced different results; Ono et al (3) reported a case wherein cystectomy combined with a third ventricle-to-peritoneum shunt improved the symptoms and decreased the size of both ventricles and cysts, whereas another patient who underwent the same procedure showed only transitory improvement (7). In other cases, the lesions continue to grow despite the resolution of hydrocephalus (8), although in most of the patients the surgical procedure ameliorated gait difficulties, bradykinesia, urinary urgency, and sudden falls, while other signs, such as tremor or restriction of the upward gaze, were not modified. In our patient L-dopa was administered with an transitory clinical improvement, but we realized retrospectively that the improvement coincided with the withdrawal of CSF rather than with the administration of L-dopa. Virchow-Robin space enlargement should be considered part of the differential diagnosis in patients with cysts mainly located in the mesencephalon. We propose the word “Virchoma” for this entity. Accepted after revision December 18, 2002.